A touring exhibition tracing the discovery of the world famous Staffordshire Hoard has been launched. The hoard comprises more than 1,500 Anglo-Saxon items found buried on farmland near Hammerwich by a metal detectorist in July, 2009. The collection was subsequently valued at £3.3m and is now owned by Birmingham City and Stoke-on-Trent City Councils. The exhibition, which has been paid for through £47,000 of Heritage Lottery Funding, will tour community venues across the West Midlands for three years and “tell the story” of the discovery, using replica items and video footage. Original pieces are on display at Birmingham Museum and Art Gallery, the Potteries Museum and Art Gallery, Lichfield Cathedral and Tamworth Castle. Chris Copp, senior museums officer for Staffordshire County Council, said: “We want to make people more aware of where they can see the hoard. “We can’t use original pieces for this exhibition because it is geared up for community venues and they don’t meet the security criteria or insurance costs. 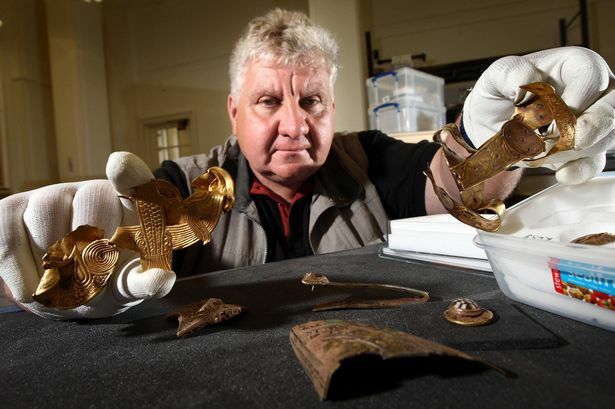 “But the hoard is important to the county and attracts huge numbers of visitors.” The exciting discovery has proved an unusual and popular tourist attraction for the Midlands. A tour two years ago of 40 original items which were unearthed attracted up to 50,000 visitors, generating an extra £1m for the local economy. An appeal to buy the hoard so it could be kept in public ownership raised more than £900,000. The treasures includes items of gold and silver, embedded with precious stones and jewels, many of which date back to the 7th and 8th Centuries. In late 2012, the same field was ploughed again and a further 91 items found.